The marketing history of Worcestershire sauce is well-documented. In 1837 the English firm Lea & Perrins began selling the exciting, newly-developed product commercially at their pharmacy/grocery store. They also sent representatives to the docks of English ports in order to convince the stewards of passenger ships to take cases of the condiment on board liners so that bottles of the product could be set on the dining room tables. The tangy, pungent, meaty-flavored sauce caught on, and soon Lea & Perrins opened more retail shops in several English towns. Along with other products, they sold their sauce at these new locations. Worcestershire sauce was also exported to other countries around the world. Now the sauce is produced in the United States, as well as in England, and other brands of Worcestershire sauce besides Lea & Perrins have appeared. The story of the origins of the recipe for Worcestershire sauce is entangled in a web of legends, but the common thread is that its place of origin was India. Versions of how the recipe came to England usually credit a member or members of the prominent Sandy and/or Grey families. Typically the stories indicate an effort to reproduce a Bengali recipe for a sauce or a curry powder, and the assistance of apothecaries/chemists John Wheeley Lea and William Henry Perrins of Worcester. In most editions of the tale, the first attempt is a failure, but the results are stored away; fermentation occurs and a later tasting reveals the delightful concoction now enjoyed the world over. 2 tablespoonfuls walnut or tomato catsup (strained through muslin). 3 anchovies chopped into bits. Mix and rub through a sieve. Put in a stone jar, set in a pot of boiling water, and heat until the liquid is so hot you can not bear your finger in it. Strain, and let it stand in the jar, closely covered, two days, then bottle for use. The versatile sauce, homemade or commercial, is used on broiled meats (especially steaks), in Bloody Marys, in stews, in recipes for Welsh rabbit, even in some blue cheese dressing recipes. In 1981 the U. S. Department of the Army spent $6000 to prepare a 17-page manual on how to buy Worcestershire sauce. It really isn't that hard. Go buy some and add its mysterious piquancy to your foods. 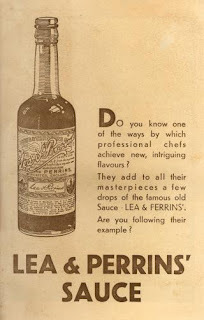 A Lea & Perrins advertisement, CA. 1920. 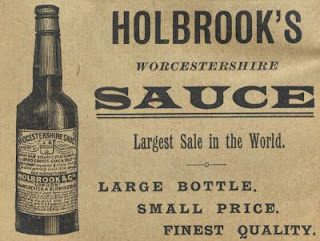 A 1902 advertisement for Holbrook's Worcestershire Sauce, competitor of Lea & Perrin's. Cook noodles according to package directions. Cook brown gravy according to package directions. In a skillet, add enough olive oil to cover bottom of skillet and heat over medium heat. Add beef, onions, Worcestershire sauce, garlic, salt and pepper. Stir. Cook beef until no longer pink. Add mushrooms. Stir. 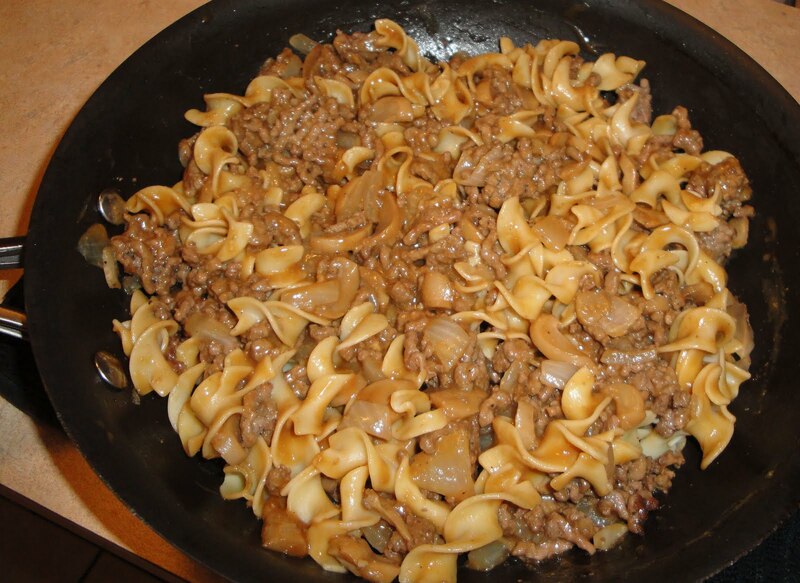 When noodles are cooked, drain well, then add to meat, pour gravy over top of noodles and meat. Stir. Enjoy! I really enjoy all the information you have been giving, and what a tasty way to use ground beef! but then again I love anything with noodles! I haven't had dinner yet, so seeing this post is making HUNGRY!! =] Looks really good, and I love how you didn't just go for those "helper" packs at the grocery store! I do not know if you remember this scare from 2005 Crosse and Blackwell's Worcester sauce had a bi problem wit some tainted chilies. Hi Chef Dennis, I really enjoy food history. I love pasta too! Thanks so very much for stopping by. Never would have thought you could make your own Worchestshire cause! Thanks! It's interesting that you mention walnut catsup - I was just reading about it in my cookbook from Colonial Williamsburg. It has recipes from the late 1780s. They made all kinds of stuff from walnuts! Cool! I actually make my own Worcestershire sauce - due to allergies. It takes a ton of ingredients, then has to steep for about 6 weeks. It is amazing! My recipe came from Saveur. Hi Tracy, I collect cookbooks,I would love to have that cookbook. I love old recipes. Recipes from late 1780s would be so cool to have. I'm going to have to try and find that cookbook. Thanks for the info. Hi Ann, I have never thought about making Worcestershire Sauce. I bet it's good. Thanks for stopping by. Interesting article again, I have a recipe for worcestershire sauce. Love the pasta dish. wow its really awesome!!! new to me!!! will give a try!!! Your history behind the food items is very informative and useful. Who knew that you could make your own Worcestershire sauce? Your noodle dish looks so good, and an easy dinner option. The information on Worcestershire sauce is really interesting. I am surprised to know that this sauce can be made at home. Great, insightful post. Hi Christine! That pasta looks scrumptious; I always crave carbs when I'm sick! Also, I learned alot about worcestershire sauce that I never knew. Thanks for the interesting, entertaining post! Hi Becky, I've never thought about making Worcestershire Sauce. Thanks, Becky. Hi Becka, thanks for stopping by. Have a wonderful weekend! Hi Jess, I think your little one will like this. Hi Jodi, sorry to hear you are sick. I hope you feel better soon. You're welcome! Great info, Christine...and a nice and tasty meal! I can see whipping this up on a busy weeknight...thanks! This looks delicious- interesting ingredient walnut ketchup. All you recipes are so down to earth with everyday food. Rachel Ray would love to meet you! You offer what most people need now days with all the busy schedules and tight budgets. Thanks for sharing. Lovely post! Homemade worcestershire sauce...a great idea! But it's all that much better for us, and yummy too, even if it's not exactly like Lea and Perrins. Love the Pasta Helper recipe too. Hi Tina, thank you for the kind words. I would love to meet Rachael Ray. This sounds awesome and I love your "imitation" Worcestershire sauce! Great recipe!